Never do you feel more spoiled than when you are relaxing on the deck of a luxury yacht, cruising along the blue water of the Mediterranean sea. With Navimerian Yachting you can bring your own floating boutique hotel from the most luxurious ports to the smallest of sandy beaches. 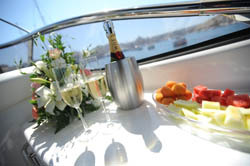 Our yachts are perfectly adapted for Mediterranean cruising, with large open outdoor entertainment areas with wet-bars and grills, luxury interiors with two permanent cabins sleeping four people, all with TV and en-suite bathrooms, and large living areas.